The following report prepared by the National Counterterrorism Center (NCTC), Department of Homeland Security and Office of Naval Intelligence was obtained from the website of the National Volunteer Fire Council. The document has since been removed from the website. (U//FOUO) Although most terrorist IED attacks outside war zones target civilians or symbols of authority and usually involve a single device, some are designed specifically to target emergency response personnel. The most common tactics involve using secondary or tertiary devices in tiered or sequential attacks intended to kill or maim response personnel after they arrive on the scene of an initial IED incident. • The extent of government control in the intended target zone is a critical variable in operational planning for attacks against first responders. Whether attackers have sufficient access to the target area to gain familiarity with the landscape, the presence of police or other security forces, and even possibly their emergency response procedures are significant factors in attack preparation. • Terrorists who are well-versed in the render-safe procedures used by explosive ordnance disposal (EOD) teams are the most likely to construct secondary devices capable of defeating techniques to defuse or destroy them. (U//FOUO) There is widespread concern about the availability of information in online manuals, videos, and extremist discussion forums on IED design and tactics that can be used by plotters in Western countries—including the US. • Only one Homeland attack plot by homegrown violent extremists (HVEs)a in recent years was intended to specifically target first responders, but a successful Homeland attack may be imitated once it is publicized in the media. • Growing awareness of the tactics and techniques used by terrorists elsewhere in the world— particularly in East Africa, South Asia, and Yemen —could motivate HVEs and other Homeland adversaries to deliberately plot attacks that target first responders. • The targeting of EOD personnel during execution of render-safe and exploitation procedures represents a higher level of adversary tactical sophistication that could provide an early indication of the need to reassess the Homeland IED threat environment. (U//FOUO) All incidents involving IEDs, including those that fail or are a hoax, draw emergency responders to handle any casualties, secure the area, deactivate or dispose of other potential explosive devices, and begin the process of investigative forensics. Although most terrorist IED attacks target civilians or symbols of authority and usually involve a single device, some devices encountered outside war zones are designed specifically to target emergency response personnel. Motivations for targeting first responders are highly dependent on context. • In countries coping with insurgencies or political unrest that result in a sustained level of violence, responders may be deliberately targeted to counter their capabilities to deal with attacks by the armed opposition. Insurgents in the Iraq and Afghanistan war zones primarily target first responders—military police and explosive ordnance disposal (EOD) personnel—to degrade their ability to counter the insurgent’s primary weapon of choice, the IED. Insurgents in countries like Thailand—where the primary focus is to counter government rule or occupation—most likely attack first responders because they represent the ruling government. • Criminal organizations under law enforcement or military pressure—such as drug-trafficking organizations (DTOs) in countries like Mexico and Colombia—may attack first responders to deter or inhibit disruption operations against them. • Terrorist groups or individual extremists with ideological agendas may target responders deliberately to enhance the magnitude of their terror attack, creating increased fear and media attention by demonstrating that even would-be rescuers are vulnerable to attack. (U//FOUO) The extent of government control in the intended target zone is a critical variable in operational planning for attacks against first responders. Whether attackers have sufficient access to the target area to gain familiarity with the landscape, the presence of police or other security forces, and even possibly their emergency response procedures are significant factors in attack preparation. Freedom of access also allows time to set up the attack, which is particularly important if multiple devices are to be employed. Attacks against responders have been particularly successful where an adaptive adversary is able to control the response environment and rely on support from local populations, either through cooperation or coercion. A pervasive security presence or particular vigilance by local citizens or police forces may not prevent conducting a single attack targeting civilians but could make it much more difficult to specifically target response personnel. 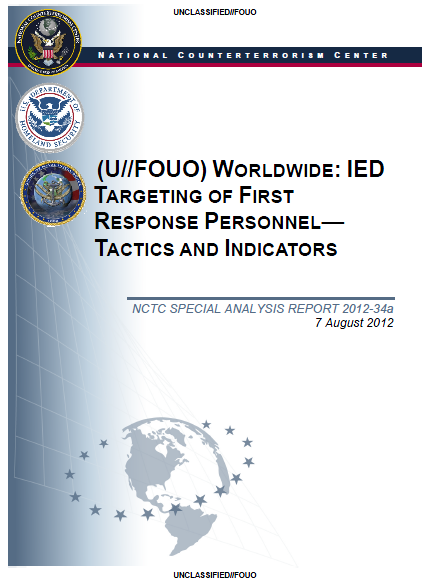 (U//FOUO) Information on IED design and tactics has become available to plotters in Western countries—including the US—who might then employ options, such as tiered attacks targeting emergency responders, they otherwise might not have considered. Explosives training manuals, extremist literature such as Inspire magazine, and Internet videos and chat rooms are widely disseminated. Violent extremists making available knowledge of EOD procedures and countermeasures could facilitate and significantly enhance the capability of terrorists to lure responders into IED ambushes and construct devices that would detonate as authorities tried to contain or deactivate them. A successful attack against responders may be imitated once publicized in the media. • The diffusion of IED design information and tactics is not bound by geographic or motivational constraints. A review of bombmaking publications available on the Internet or in printed form dating back to the 1960s illustrates that an extremist can readily access a wide variety of manuals detailing EOD procedures and information on how to build victim-operated IEDs. • Manuals, videos, and forum discussions are not complete substitutes for practical experience in IED emplacement, however; evidence of handson training and IED testing by terrorists in Western countries could give security services and law enforcement indicators of possible attack plotting. (U//FOUO) Terrorists interested in conducting complex IED attacks, including deliberately targeting emergency personnel responding to an initial IED attack, can also learn from the examples of groups that have such experience in high-threat Western environments, some of whom are willing to provide expert training or instruction. Provisional Irish Republican Army (PIRA) bombmakers in the UK in the early 1990s created and employed a wide array of IED switches intended to reduce the effectiveness of security forces by targeting British and Irish EOD and response personnel, according to military reporting.